Henri Matisse was the leading painter in the Fauve movement. As a French Expressionist, he was driven more by feelings of joy in the act of making art, rather than by angst. In his elegant drypoint, the artist displays a refined use of line to achieve a sense of harmony between two-dimensional and three-dimensional qualities. Matisse employs an economy of means in the use of line to suggest the delicately foreshortened clothed human figure. Le Bonnet Fleuri is a small scale work, a drypoint on Chine applique on Arches Velin paper, with only 25 replicas. 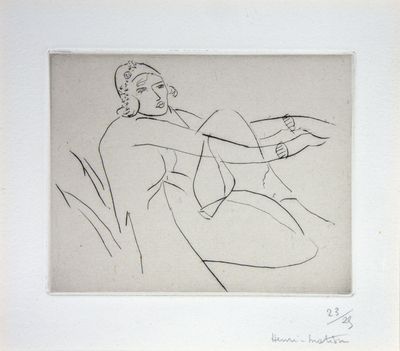 A portrait of a clothed woman is presented through Matisse’s polished use of lines that elegantly unifies two-dimensional and three-dimensional traits.